“Outside In Doors” is painter Lola Gil’s dream-like exploration of both her interior and exterior life. Two years in the making, these luminous works evoke a new state of consciousness. A wide-eyed, wistful female figure serves as the stand-in for the artist. These are not self-portraits: the artist used a variety of models to serve as her representative. Their variability serves as an interpretation of the artist and her imagination. 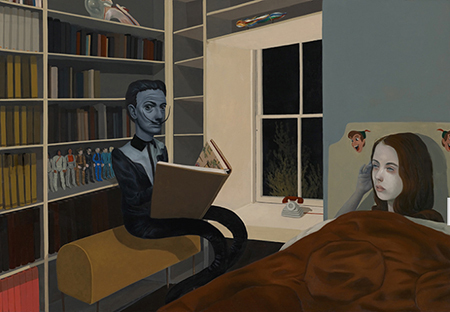 In “Bedtime Stories,” a black and white Salvador Dali reads to her, tucked under the covers. In “Quite Alright Hiding” she is literally blending into the wallpaper, as are framed works of art — while in the foreground paint brushes stand at the ready, the tools of the artist’s trade. The titular painting is Dali-esque, with the girl’s head flattened and angled. A single eye floats overhead, a body-less boy perches next to her, and a curved and desolate landscape serves as background. Both intrinsically narrative and edged in the surreal, “Outside In Doors” transports us into an interior world as rich and strange as a lucid dream. If one dreamt in black and white, Todd Carpenter’s “Shadows Discarnate” offers a perfectly realized noir reverie. So precise and delicately rendered as to appear photographic, Carpenter’s exquisite black, white and grey oil on board works have an inward glow of pre-dawn light, a captured, dusky-moment. These neutral toned works are poetic images of a hauntingly real Los Angeles. Carpenter and Gil both take us on a journey: Gil’s to an interior destination, Carpenter’s through an exterior locale.